Ow, My Eyes, My Poor Eyes! One of the things that I hate the most about my job is overhead fluorescent lights. How, how could Mr. Tesla unleash such an evil invention upon us? Anyway, even after jumping through a few hoops to get the lamp directly over my cubicle turned off and talking most of my co-workers into turning theirs off (everyone seems to like it better without them), there’s still way too much glare from remaining lamps. Short of building The Tent of Doom over my cube I found some relief by wearing a promotional baseball cap that found it’s way onto my desk. Yeah, it might say “Red Carpet With Joan and Melissa Rivers” on it, but the cap really cut the glare down. This made me remember a stereotypical picture of an accountant or an editor: in cartoons they seem to wear those funny little green visors. Now I understood their purpose – it’s to cut down on the glare. I still don’t understand why they wear weird little bands or garters on their sleeves. 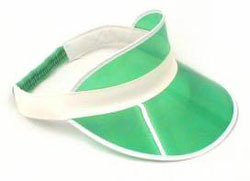 It’s interesting to know why the predominant color of the accountant/editor eyeshades is green. It might have something to do with the green color of the banker’s lamp. I once seen a blue banker’s lamp at Staples, but when I tried to buy it an extremely rude stockboy took it away because it was the only display copy. These days it seems that the only professionals who wear green eyeshades are casino dealers. I could buy one, but I am afraid wearing it at work would make me look even more eccentric, which is probably not a good thing. 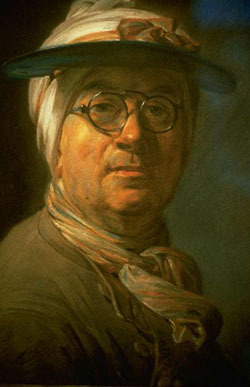 It looks like in the olden days eyeshades were worn by accountants, editors, typesetters and Morse code operators. I wonder if early computer programmers wore them too. I really don’t see a reason why nobody except the card dealers wear them anymore – if anything there’s even more glare in today’s workplace than ever before. Well, maybe the eyeshades are out because they look dorky, like many other old wardrobe elements. I don’t miss the old high waistline pants which really freak out generation Y kids when they see old James Bond movies, but I wish old fashioned headgear would make a comeback. I absolutely love the top hats, bowler hats and fedoras. I always thought that tuxedo or “black tie” was just about as formal as you could get. As it turns out that white tie is not just a tuxedo with a white bowtie. This reminded me about a newspaper story about a company that had “dress up Friday” and instead of dressing in jeans men came to work in tuxedos. Apparenly they had a lot of problems eating out – other restaurant patrons mistook them for waiters.